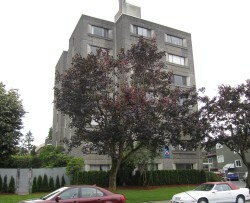 Chelsea Tower, at 330 East 6th Avenue in Vancouver opened in 1975. Located just a few blocks east of the pleasant Main Street neighborhood, it provides residents with easy access to community recreation in a convenient urban setting. The building has many amenities, such as a backyard and patio for social events and a penthouse lounge sporting a kitchen, big screen TV and a panoramic view of downtown Vancouver and the harbor. In January of 2000, New Chelsea Society entered into a joint venture with the Kidney Foundation of Canada – BC Branch, and BC/Yukon Command of The Royal Canadian Legion, to provide 4 suites at New Chelsea Tower for kidney patients and their families. The suites enable the patients in financial need to be accommodated near St. Paul’s and Vancouver hospitals while they are in the city for a kidney transplant and follow-up treatment. 40 bachelor suites and 6 one-bedroom suites (for married couples). 4 furnished suites available for kidney patients and their families. Penthouse lounge with kitchen facilities, comfortable seating, TV and panoramic view. Backyard with garden plots for resident gardening. Rent geared to income; tenants pay 30% of gross household income.